High water is a regular feature of springtime, weather the result of heavy rainfall or snowmelt washing down throughout the day. Fly fishermen with the “know how” can do very well in higher flows, with the added benefit of often having most of the river all to themselves. Modern wet weather gear ensures personal discomfort is at a minimum, and a little local knowledge ensures enough action is had to keep up the entheusiasm. Trout are genetically programmed to survive in high water. They know their surrounds and where to find suitable shelter. They must continue to feed to maintain energy levels and the opinion that trout cannot be caught in high or discoloured flows often comes from anglers who lack the either the confidence or experience to deal with such conditions. Up to a point, in rising waters trout will still hold deep in familiar runs. A fist-sized rock is all a fish needs to divert the impact of rushing water. The quiet pocket of water immediately behind such obstacles will safely harbour fish in surprisingly harsh conditions. Aggressively fishing a large nymph or streamer pattern close to the streambed will often tempt fish at these times, the more generous offering and promise of a large meal enticing the fish out from cover. When the intensity of the flow increases as such that it begins to shift the riverbed, trout will seek out alternative accommodations. They will often move around quite a lot at these times; what was yesterday a calm ripple or eddy is now a raging torrent. The potential to feed and maintain energy levels becomes limited, so they must go in search of ‘greener pastures’. The wise angler will do well to focus on the inside bends and more substantial rocks along the slower river margins. Trout are visual feeders and these areas away from the main flow will often provide better visibility with less suspended sediment throughout the water column. Silt will sink to the streambed with little current to stir things up often leaving a cleaner film close to the surface. Likewise, smaller side channels and backwater systems, again, areas away from the main flow will often provide productive foraging areas for trout in adverse conditions. They can move around and search for food without fighting the full force of the flow. Many of these areas will not even support water during normal flow conditions, but as levels rise, they become inundated, and are quickly inhabited by trout searching for sheltered lies. 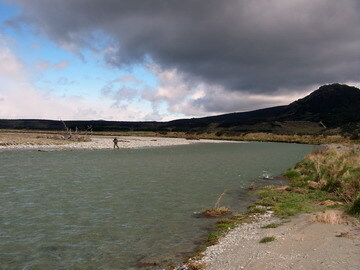 Last October Brian Reid and I fished a series of side channels on a lowland Southland river. Upstream nymphing wasn’t proving too productive, and despite taunts and the dismissing laughs from my companion I tied on a large 1/0 saltwater streamer. My second cast into the eye of the braid produced a lovely 6lb brown, and after quickly changing over to a large streamer pattern, Brian too had a nice bend in his Sage. Imagine Brian’s surprise when he returned but two days later to find our series of braids high and dry, with the main river channel back to normal flows some 100 yards distant. As these areas are often foreign to the trout, they will be on high alert. You must ignore the raging torrent of the main channel beside you and approach these quieter side braids and backwater systems with great care. Once spooked, these fish are unlikely to return. As always, presentation is everything, and it is the practised angler who will share in often-great success in these locations. Fish the sheltering lies. Look for the slower edges and pockets, which provide relief from the flow. Often these areas may only be inches from out from the bank, in amazingly shallow water. Look for locations where the current brings food in towards the bank. This is where you will likely encounter trout. When snowmelt chills the main flow, you will often find trout along the near bank in water barely deep enough to cover their dorsal fin. The soft, grey appearance of the main flow indicates ‘melt’ and it is easy to see those areas where the flow passes by. Fish these areas carefully, and even in discoloured flows, trout holding in these shallow water positions can often be coaxed up to a dry. However, when fishing in adverse conditions it is the streamer that lights my fire. There is something about ignoring the usual size 16 Southland fly selection and reaching for the box of big size 6 Woolly Buggers. 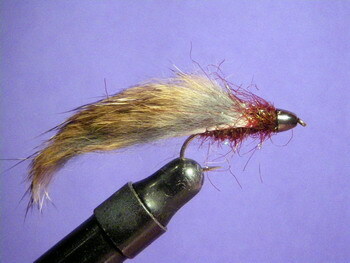 I tie mine streamlined for river use; I omit the palmered body hackle, which I feel causes too much drag in the current and tie a big, bushy marabou tail or strip of rabbit pelt. I favour a dark body colour, to create a heavy silhouette in murky conditions, and usually add a tungsten bead to ensure my fly gets down and dirty. Movement is the key. Rabbit strips, marabou and other soft materials provide an enticing suggestion of life, and by imparting further movement via the rod tip one can bring any pattern to life. Remember you are imitating a small baitfish. Whilst they may move strongly through normal water conditions, in times of increased flow they will struggle, so your streamer retrieve should be imitative of short, sporadic bursts… Baitfish in heavy water conditions do not power upstream in powerful, metre long bursts. Streamers can be fished in many ways. I often like to throw my Bugger upstream into the eye of the pool, and strip it enticingly back downstream, slightly faster than the pace of the river. I concentrate on keeping in contact with my fly, feeling for any hesitation or bump down the line. Despite the ‘big fish, big fly’ combination, the take can be just a subtle pluck, or hesitation of the line. ‘Down and across’ can be the saviour in the much - feared NW. I begin at the top of my beat and fish my way back downstream through the fast water, and along the outside bends on a tight line. Pitch your fly across and slightly upstream, and mend as your line drifts down to attain depth. When alls in the desired position, allow your fly to swing around below your position on a tight line. Most often, the take will come as your fly begins its enticing swing. However, a tactic I have used in many conditions over the past few seasons, and one well worth experimenting with is fishing your streamer below an indicator, dead drift, upstream nymph style; Its just like throwing your traditional hare and copper, just super sized! This method is by no means new, and I came about this practise after becoming frustrated at watching large backcountry fish ignoring presentation after presentation with small, life size nymphs. The presentation landed wide, but as the fly tumbled downstream the fish did not hesitate to race a metre or so across stream to nail this large, high protein mouthful. The indicator stopped, I lifted the rod and a healthy Northern Southland jack went into overdrive. Since then I have been using this method on many an occasion, in both fine weather and foul. The theory is simple; why bother with a hundred and one presentations with a tiny nymph representation when the same fish is likely to move to a large, dead drift streamer upon often the first pass. Big fish require a lot of food to maintain both energy levels and overall condition. It takes a lot of mayfly and caddis naturals to offset a large bully in the nutritional stakes, and these fish know this. It is commonly accepted that these fish become more likely to spook with each subsequent cast, so why not tie on a big streamer and hit them first time round. Whilst I enjoy great success dead drifting streamers beneath indicators, the beauty of this method is that drag doesn’t really matter. Whereas a dragging nymph imitation will often send a trout to cover, a streamer moving unnaturally through the water will not. Bullies will dart across the current at pace – Deleatidium wont. On that note, the next time you see a desirable fish requiring an impossible drift, maybe on the far side of the current why not run a streamer past him? You have everything to gain! 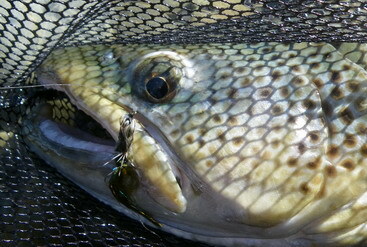 From a casting point of view these flies often require subtle modifications on your stroke. When throwing large streamers, remember to widen your casting arc, or tilt your rod plane a little to the side. Maybe consult my column in the June / July 2007 issue of Troutfisher and throw an elliptical cast! The last thing you want is to crash a size 4 tungsten into your rod tip. Slow down your stroke a little to allow for the less aerodynamic fly to make its way through the air, and adjust your timing accordingly. So get out there this season and play around with streamers. Don’t let the weather stop you. There are plenty of fish to be caught and lessons to be learnt – Foul weather can often be the most educational teacher!